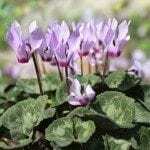 Can you grow cyclamen from seed? I have cyclamen that have produced seed pods. How and when can I plant them? Allow the pod to remain until it dries and gather the seeds (which should be light brown in color) before the pod splits open. You can place a plastic sandwich bag over the pod to catch the seed in case it opens before you get to it. Just a heads up - growing cyclamen from seed is very challenging. You will want to soak the seeds for 12 hours before planting. Cyclamen seeds should not be stored too long before sowing as the germination success rate might be reduced. Sow seed 1/8 to 1/4 inch deep in flats filled with moist, nutrient enriched moss peat. Germination, which takes 4-6 weeks, needs to happen in the dark and at soil temperatures between 68 to 72 degrees.